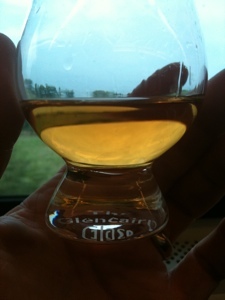 The Coopered Tot: Three expressions of Glenrothes ascend the ladder of age, wood, and august presence. Three expressions of Glenrothes ascend the ladder of age, wood, and august presence. On a visit to my local liquor emporium (the magnificent jumble known as Park Avenue Liquors) I spied this lovely sample pack from Glenrothes, sporting 100ml mini bottles - a more generous portion than the 50ml miniature or 3cl sample bottles reviewers often use as samples. They are the No Age Statement "Select Reserve", the vintage 1998 and the vintage 1985. Priced in the mid $30s it wasn't a hard decision. "The labels of the OB's from the 1990's and early 2000's have printed signatures for the 'checked' and 'approved' dates on the label. This gives the impression that these are small batches, but in fact all the 'vintage' releases are massive 'vattings' of many different casks. And the dates themselves don't always make a lot of sense either. My 1987/2000 vintage was checked by one J. L. Stevens on 23/5/'87. That makes sense; I assume that was on (or around) the distillation date. But the fact that it was approved by someone who's name I can't read (R. H. Fenwick?) 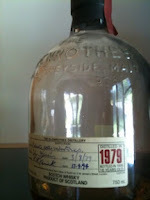 on 3-9-98 while the whisky was bottled in 2000 makes no sense at all...."
Funny, I recall being put out by that with my 1979 bottle that was checked on 3/8/79 and approved on 17*9*94, but bottled in "1995 Aged 16 years". This implies that the contents were checked on the order of a year before bottling because the 16 anniversary of distillation happened on August 3, 1995. I was also a bit put out by the fact that the label appears handwritten but was clearly printed. This appeared like trickery - although by now I've seen it so often (such as on most of my favorite bourbons, for example) that I no longer hold it against anyone. Frankly I didn't really hold it against the 1979-1994 example, as the whisky in the bottle was rather good: fairly dry, nicely wooded, with lovely dried fruits and a bit of leather. Rather august - but somehow didn't tickle my monkey bone enough to buy another. FYI, while we're on the subject the two vintage examples in this review are so labeled as well: the 1985 vintage is checked 21/7/85 and approved 31/5/05 and "bottled 2005". The 1998 vintage is checked 17/12/98 and approved 11/02/09 but "bottled 2010". Nose: initially a bit harsh with some raw spirity, grainy onion notes, but after some air honey, quince, floral vanilla slight metallic note like nickel - but isn't bad and fades with time. After 15 minutes of air perfumey fruit basket aromas of green melon and pear show up lightly. It's a nice nose for the most part. Sweet entry with cereal and malt sweetness. Pancakes with treacle. There are some sweet heathery floral grassy meadow notes up front too. The mid-palate falls a bit flat. There's a thinness in the mouth feel and flavor - a "grainey" quality, like a nice blend like Chivas, that I'm not used to with single malts. At the turn to the finish there is a slight bitter note that feels of a piece with the midpalate thinness. There's spirit heat but not a lot of wood influence. All in all a nice pleasant young feeling malt with some hints and glimpses of really nice aromas and flavors. Sadly the good ones don't dominate. It's borderline between two and three stars. A word on value: Select Reserve is $36.99 at Shopper's Vineyard (as opposed to $52.99 for the 1998 Vintage expression). Johnny Walker Black Label is $33.99 there at the moment which suggest an immediate comparison. Head to head, JWBL has the slightly richer more neutral nose. There is less raw, grainy notes in the nose with JWBL. JWBL also has the sweeter and richer entry and more wood notes on the back end, with that slight kiss of peat. Furthermore JBWL drinks smoother and cooler, with less spirit heat at the same 40% abv. 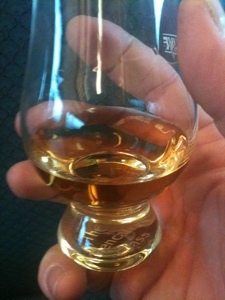 As a whole, I find JWBL a richer and better balanced dram for the money than Glenrothes Select Reserve. 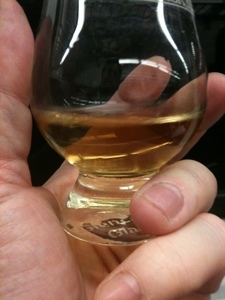 That being said, Glenrothes has clearer, more direct flavor signature. 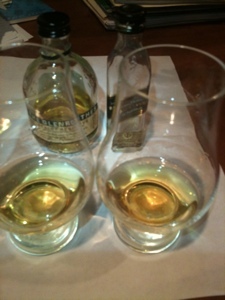 It has, as becomes clear while drinking this set of three, a Glenrothes flavor signature. This is clearly the intention. That being said, the financial gulf between this introductory expression and the first vintage expression isn't as wide as the difference in drinking enjoyment, in my opinion. Entry: off dry with a lithe elegant feel. Rich dry sherry, prunes, some broth notes, muscular dark malt, then some smoky notes, rich old oak with walnut tannins on the finish. The afterglow features some of the prunes and some sandalwood from the nose's finish. There is sweetness here, jammy fruits - and the flavor signature of a lightly sherried malt (along with some of the sulfur notes). It comes off as older and more mature than 12. This particular expression has an acidity that I didn't love and I didn't recall from others I have tried. I have a vintage 1995 on deck for the next review and I'm going to look at this issue in greater detail. Watch my blog for a follow-up shortly on this topic. As it stands, this is borderline 4 stars - which means I give it 3. I can easily recommend it, but personally don't really love it. Nose: Rich and august with musk, buckwheat, dried apricots, dried figs, and plenty of sandalwood perfumed oak. Further nosing shows a walnut nuttiness, some tanned leather, and old books. After 30 minutes or so dark sherry vinous aromas add to the mix. Lovely whisky showing its age aromas. Entry is lean of body, off dry, and rich with spicy fig jam, preserved citrus, dry Parma ham, musky spices like mace, a hint of rancio, and plenty of old book leather. The mouth feel is creamy. Tannins at the end give a cleansing oak and walnut skins finish. Reminds me of the old flagon bottles of NAS Balvenie from the late 1980s (the one with the coat of arms and flags on a gold foil label): heavily wooded and tannic on top of rich fruits turned dry from age with leather and old books. Lovely stuff - richly flavored. After about an hour it finally opens up. Honeyed, figs, rancio, leather. Old fino. It's become quite glorious. I imagine that if you had a full bottle and drank it over months then oxidation would take it to this state after less of a wait. It's worth pointing out that despite extra time in barrels with sherry this one doesn't have either the acidity or the sulfur noted in the 1998 expression. 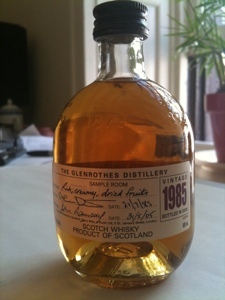 This 1985 version is a really special treat: a walk into your Grandfather's library for a special dram. Through these three expressions there is a common thread: an elegant off-dry and august presence with a lightly sherried nature and excellent wood presence. 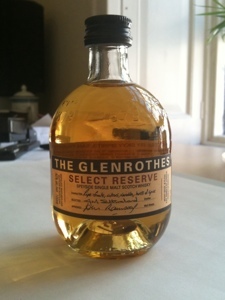 Glenrothes is a nice example of an old traditional style of Scotch whisky. I got the same sampler box a year to two back, and thoroughly enjoyed the 1998 and 1985, but found the Select Reserve damn near undrinkable, with a really strong note of rotten fruit. I've wondered if I got a bad sample, if such a thing exists? The other two were very enjoyable, especially the 1985, though as a friend points out, for $100+, I think I'd prefer a cask strength, non-chill filtered offering. Perhaps that's learned snobbery on my part. I'm not terribly surprised to learn that the "vintages" are of course vatted from many casks from that year, and I still like the notion and the possible variety it offers. I'd like to see other distilleries do something similar, though I suppose that offering a more "standard" expression is easier to manage logistically. First of all - it's a great pleasure to meet you. I read your blog and have added it to my blog roll. I find that our reviews have much in accord - except the tasting notes on the Select Reserve. As for the Select Reserve, I wasn't too happy with it either - although "rotten fruit" wasn't my problem. Maybe you did get a bad one. However I tasted some young raw spirit which greatly dampened the show. As for the 1985 and the value equation, $100 is plenty of money. I like the 1985 a lot, but partly for nostalgic reasons (its similarity to an old 80s Balvenie). I'm not sure I'd buy a whole bottle. Time will tell. Well, to be fair, Jacob is the true Scotch Drammer, he's just kind enough to let me post over there from time to time...I suppose that makes me sort of an apprentice Scotch Drammer? Thanks very much for the kind words, I'm glad you liked my review. =) It's occurred to me that I may have had a bum sample of the Select Reserve, but it doesn't seem worth the effort to try again with a rough NAS entry level whisky when there's so much else to try out there, though I did like your head to head with the similarly priced JWBL, and would enjoy doing something similar. I also enjoyed your review of the Bastille, which I found pretty much days after it came out for $20 in a random packy. Tried it on a whim and loved it, though after working through two bottles of it, I think I'm ready for something else! select Reserve is a nice entry level dram, while the 1998 is ok. i really like the 1995 vintage, and the older they get the better they get IMHO. 1985 lovely. I've tasted many vintages about a year ago or more. 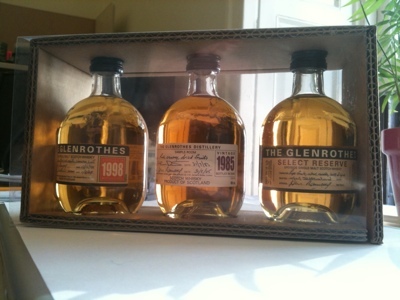 Glenrothes does benefit from longer maturation. Not all whiskies do. OMG! It's Gal from Whisky Israel, on my little blog. Welcome Gal! 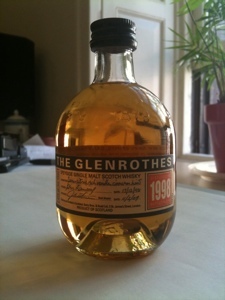 Yes, the 1995 is a 16 (or maybe 15 1/2) year old release and clearly Glenrothes likes long maturation. Seems true of a lot of Spey and Northern Highland malts. May be the climate, or the methods. Peated expressions do well younger, as do malts in areas with more rapid maturation (warmer climates, or more temperature variation).